Steel Retaining strap prevents for extensions from sliding off forks during use. 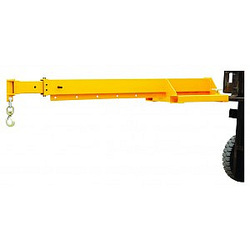 Specials made to order to suit most fork lifts. 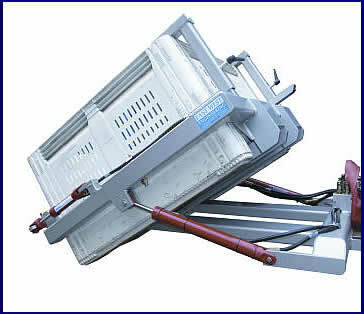 The Support Arms are adjustable to ensure secure clamping. The drum is gripped by pushing the arms against the drum centre and driving forward with the Forklift. The arms will engage around the drum and lock under the rolling hoop when raised. The heavier the load, the tighter the grip becomes. 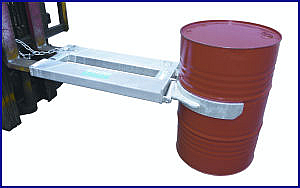 To release the drum, simply lower the drum onto ground level and reverse the Forklift. 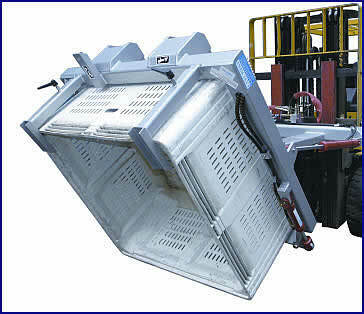 The finish on the Drum Lifter is Zinc Plated steel. Suitable for emptying 240 litre plastic wheelie bins. 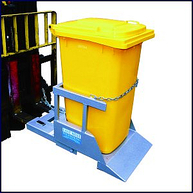 The bin is wheeled into the Tipper and secured with safety chains. The 180 degree tipping operation is simple and safe with the operator never having to leave the seat during the tipping cycle. Available for one (1) or two (2) plastic wheelie bins. Carriage Mounted Roll Prongs suitable for carpet, vinyl, fabric or similar products. 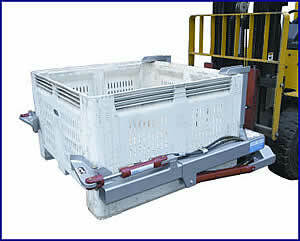 Units are available for Class II, III and IV Forklift carriages, along with pin mounted. All "QR" model Roll Prongs feature "Quick Release" lower Carriage Hooks and a spring loaded locating pin for easy installation. Prongs are manufactured from high tensile steel and can be made to any length. 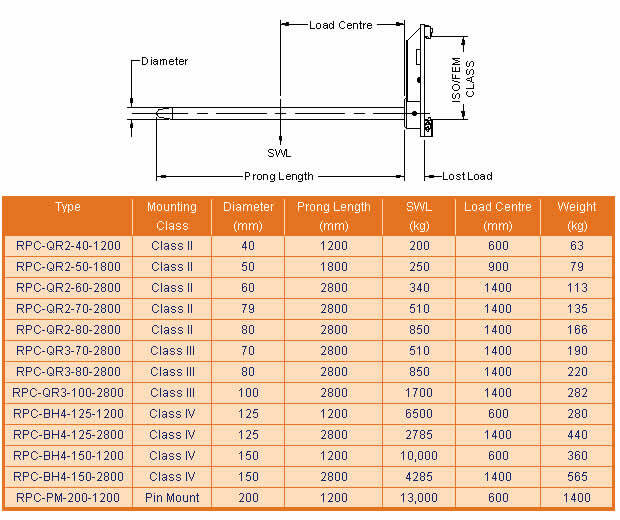 The 'lost load' on the Class II Roll Prong is 100mm and on the Class III Roll Prong is 200mm. For Class IV or V mountings, please ask for drawings of mounting plate designs and specifications. The standard finish on all Roll Prongs is painted enamel. This slip-on attachment is fitted in seconds, requiring only a single hydraulic function. 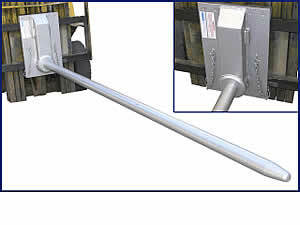 The purpose built hydraulic sequencing valve eliminates the potential to drop a bin (rotation will not commence until bin is correctly restrained), while the gentle action of the clamp arms prevents damage to the bins. 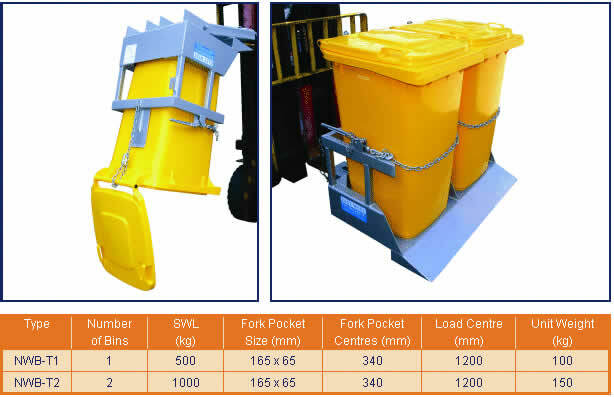 The standard FBT-SH unit will suit bins up to 1200mm square, with height range of 675 to 925mm. Non standard size and capacity attachments can be manufactured. This unit is also available in carriage mounted applications.